The elder tree is most wonderful generous to the home-brewer. Not only do the flowers make the delightful, summery, elderflower champagne, but the berries are excellent in wine, both on their own and with other fruit. I read on the 'ish forum (currently slightly creaky due to recent relocation) that elderberries are almost identical to grapes, apart from the sugar content. I've heard that it's possible to make an excellent wine from them, though I've yet to achieve this myself, partly due to lack of elderberries, partly due to impatience. I have some on the go at the moment, but as it needs at least a year, it won't be ready in time to include in this series of foraging posts. However, grape juice concentrate appears in various wine recipes, and elderberries are the perfect wild substitute. The extra sugar required is less wild, but never mind. I have some elderberry and blackberry wine on the go, but what I'm going to tell you about today is my favourite home-brew: sloe and elderberry wine. 4? days later (15 Oct), add 1 lb elderberries and the same of sugar, and about a pint of water. Note that the sloes were picked before the frost softened the flavour. Since then, I've added a tablespoonful of sugar whenever I've thought of it, which could be every day for quite long periods, and stirred frequently to see whether bubbles are still forming. The first time I made this, it stopped fermenting in about six weeks, but this one was still going at Christmas, which is well over two months. I can think of two possible explanations for this; either it's much colder this year than two years ago, and it's going more slowly, or the yeast I have this time is tolerating higher alcohol concentrations, and surviving longer. Considering how much sugar I've added, it would be ridiculously sweet if the yeast wasn't doing its thing, and it's not, so I think the latter explanation is more likely. This could be quite a strong drink. I managed to keep one small bottle of last year's, to see how it matures. 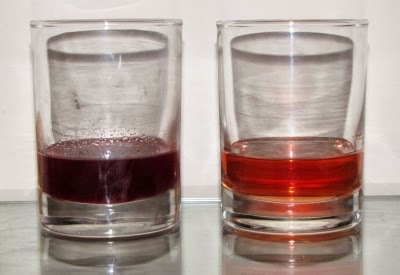 Sloe and elderberry wine, 2013 and 2012 vintages. A year's maturing makes no discernible difference to the flavour but as you can see, the sediment does settle out, leaving a beautiful clear wine. This is a sweet, strong, after-dinner sort of a drink. I shall continue making it so long as I can find the ingredients, which should be quite a long time.